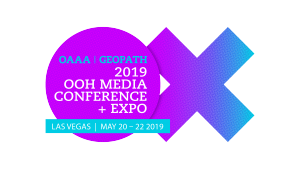 A series of programmatic education offerings will be presented at the 2019 OAAA\Geopath OOH Media Conference + Expo to be held May 20-22 at the Aria Las Vegas. One mainstage panel and two instruction workshops will focus on recognizing the opportunities and challenges of programmatic commerce in the out of home advertising industry. Programmatic Platforms: Integrating OOH Into Omnichannel Campaigns. Featured on the mainstage, a panel of programmatic experts with experience in omnichannel planning will explain the complexities of planning across media and why it is absolutely imperative for the entire OOH industry to adopt programmatic buying and selling as a core business function. Fingertips to Keyboard: Programmatic OOH Debate. This workshop will explain current trends in programmatic transactions as panelists engage in a lively debate about standards and protocols defining the OOH programmatic ecosystem. Programmatic OOH Success Cases. In this workshop, Intersection CEO Ari Buchalter will moderate a panel of advertisers and agency executives, who will share stories about successful OOH campaigns bought programmatically. All programmatic content will be held Tuesday, May 21. A full schedule of programmatic education with panelists and presenters is available for download. Workshops and panelists are subject to change. Further information and registration for the conference are available here. This entry was posted on Monday, March 18th, 2019 at 18:17 @803 and is filed under DailyDOOH Update. You can follow any responses to this entry through the RSS 2.0 feed. You can leave a response, or trackback from your own site.